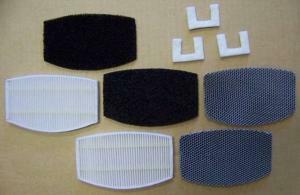 Set of replacement filters for your Thermax UV Light Air Purifier. Includes 2 of each of the filters below and 3 fragrance pads. Breaks down poisonous fumes and VOC’s, i.e. formaldehyde, ammonia. --Kills germs, viruses and bacteria. Kills mold, mildew and fungus spores. Eliminates the smell of smoke, and other annoying odors.